The season for Brown Trout in Lough Corrib is from 15th February - 30th September. Lough Corrib is one of the world's leading trout fisheries. Many anglers visit the area to try their hand at fly fishing for trout. 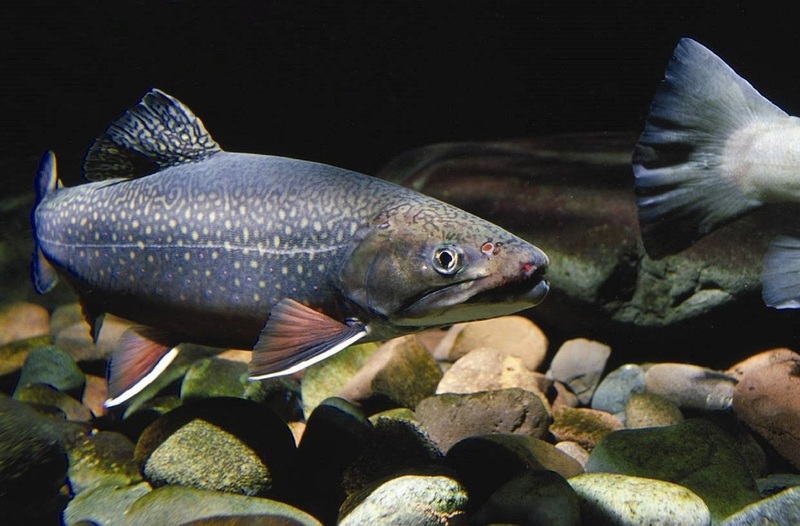 The trout is a medium sized fish, but generally grows 40-80cm and anywhere between 1kg and 27kg. They prey on other small aquatic creatures. They can live for up to 20 years. The Pike is also called the Esox. Some think this name comes from the Irish for fish, "iasc". They are torpedo shaped and have sharp teeth. They have been known to grow longer than 1m and over 30kg. They eat smaller fish, and sometimes even eat smaller pikes. 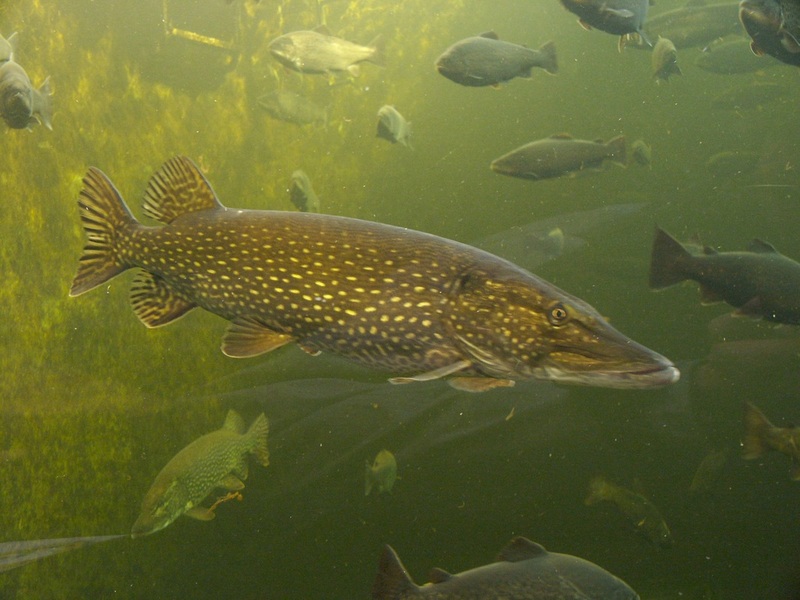 Anglers usually fish for pikes with bait, dead or live, or with a lure. They have to be careful of the sharp teeth. 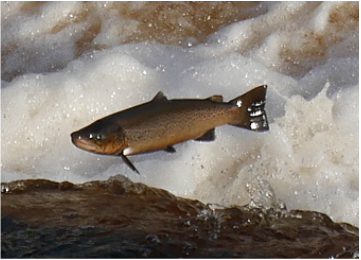 The Atlantic Salmon that appear in Lough Corrib are some of the largest of the salmon species. They can be almost a meter in length, and over 5kg after only two years. caddisflies, blackflies, mayflies, and stoneflies. Anglers use both bait and flies to catch the salmon. The Perch found in Lough Corrib is green, with dark stripes on its side and orange colour on its tail. The fin along its back can be quite spiky, but anglers say it is a good fish to eat! They can be caught with nearly any bait. Eels are long, snake-like, nocturnal fish. The European Conger eel is the longest and heaviest, growing up to 3m and 100kg. Conger eels can be found in Killary Fjord in Galway. Eels in Lough Corrib are more rare. They are thought to breed in the ocean, and spend their time in freshwater buried in the sand or mud. 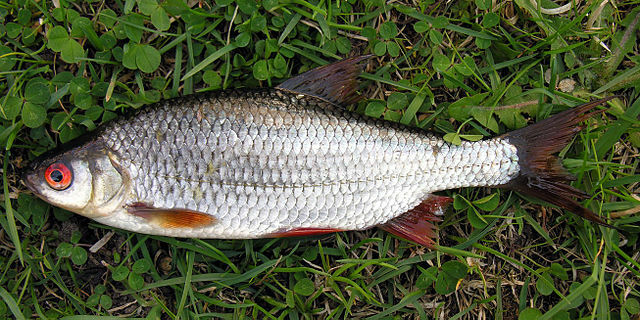 The Roach is a small fish, with a silvery body and red-orange fins. They like to live and feed deep in the water, but angler's can catch them with floats too. They are hardy fish, and can survive certain water pollution and temperatures that would kill or drive away other Lough Corrib species. They eat both plants and other small aquatic creatures. While fishing on the beach one evening about 1935 or 1936 I saw a fish floundering in the water. It was a silver-coloured fish round and flat. I sent it to a fish company in Dublin to find out its name but apparently they didn't know and it ended up in the Museum. 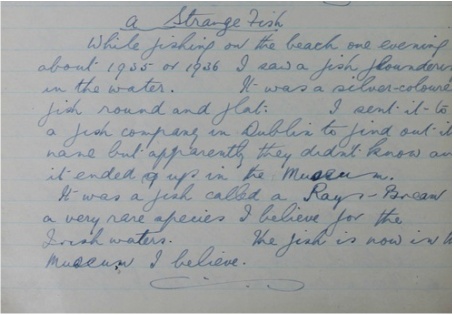 It was a fish called a Rays-Bream a very rare species I believe for the Irish waters. The fish is now in the Museum I believe."